The winter Solstice is my favorite holiday. It marks the most welcome turning point of the year, when suddenly optimism reigns, even if it actually rains. Yesterday, despite the worst possible weather, characterized by uninterrupted pouring rain and temperatures in the low thirties, my heart was light with the promise of steadily decreasing bleakness. I also won my first Eastern Cup ski race and $300 and went caroling in the Outdoor Center dorms with Rob Bradlee. My shooting improved from 40% of shots hitting the target in the first race to 50%, 55% and finally 70% in the last race. In practice leading up to these races, I would say that my average shooting was somewhere around 60%, so I was glad to stay fairly consistent with that percentage in the race environment. I also felt much better skiing towards the end of the week. I think I just needed a few races to shake off the cobwebs from a long training season. It warmed up (from below 0 degrees to above 0 degrees) which helped with the ski speed a bit, too. I just about doubled the total number of biathlons that I've done in my life at these trials, so I am still enjoying a very steep learning curve. I learn so much from every race, and can apply that knowledge and experience right away toward the next one. Casual wear for outing to grocery next door. Happy with my 2nd place in the mass start. Winning smile on top of the podium! There are a number of different race formats in biathlon. Read the Wikipedia article on biathlon race formats for a good explanation of these. At these trials, we did two sprints, then a mass start, and then another sprint. They started the women just a few minutes after the men, and at one point Mike, Ethan and I were in the penalty loop at the same time... "Misery loves Company." I "cleaned" (hit all five targets) for first time ever in a race! It is amazing how much easier the 2.5k lap feels when it doesn't begin with an extra 150m penalty loop. It was so windy that the barrel of my rifle was blowing all over the place, and in one standing stage, I only hit one target and it was not even the one I was aiming at. 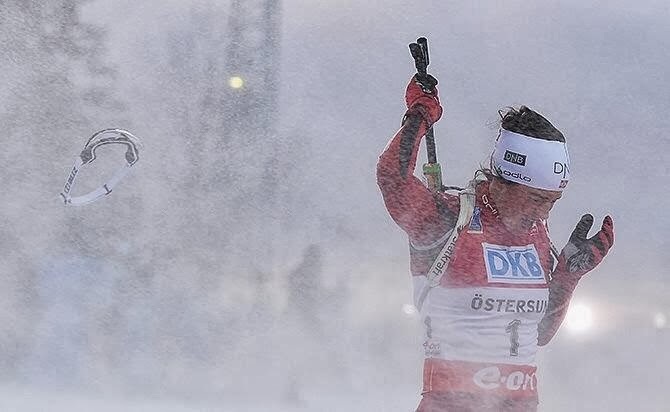 My teammate Susan Dunklee, who is a member of the US Biathlon team, was competing at a World Cup event earlier this winter in Sweden during which the women's race was stopped part way through due to wind, and the men's race was cancelled. Susan told me that US biathlete Time Burke's "strategy for standing that day would have been to aim at the middle target and keep his rifle level. That way if a gust caught him, he would just move right or left (not up or down) and still have a good chance of accidentally hitting a different target." My race was not that windy! But you can imagine was shooting in any amount of wind might be like. So after 4 trials races, I ended up second on the ranking list. 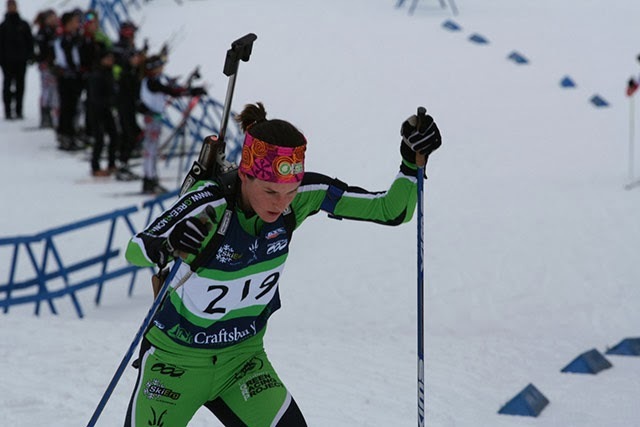 The US Biathlon team is only bringing one woman to the IBU Cup this year, so unfortunately I just missed the cut-off! But I am very proud of how i did and look forward to doing more biathlon racing. First biathlon race, and first doping control! Two exciting things happened yesterday. I did my first official biathlon race of the winter, and I peed in a cup in front of a stranger! Your choice as to which was more exciting for the spectator. The race was at the low end of the average range for me. The skiing felt so hard the whole time! It is amazing how hard the first few races of the season can feel. There is a big difference between being in good shape, and being in race shape. I still had the fastest skiing time of the day among the women, but I would like to be much faster. And if I am going to miss six targets, I need to ski much faster! I missed the last two shots in prone, but they were both good shots, meaning I didn't do anything really wrong, and the bullets were just on the edge of the target. The important thing for me (and any biathlete) is to focus on the shooting process so that it is exactly the same every time, whether in practice or a race. I think I executed well...just didn't hit the targets! In standing, I am simply not yet at the point where I can get my rifle to settle on the target at all when I shoot with a highly elevated heart rate. It was only about a month ago that I achieved that level of stable "hold" while standing perfectly still and breathing normally. So basically when I arrive at the range 20 minutes or so into the race, it looks to me through the sight as if the targets are jumping all over the place. My job is then to focus on relaxing and pulling the trigger as gently as I can, hoping that I happen to be on target when the bullet goes! (For more on this kind of shooting methodology, check out this blog post I wrote on my team's website last year.) Unfortunately in yesterday's race, I was only on target when the shot went off for one out of five shots. So I skied four penalty laps before heading out on course for my final 2.5k loop. I was pleased that I still managed to come in 3rd, but certainly hope to do better skiing and shooting in the next three races! Then came the fun part: because I came in the top three, I got to go to US Anti-Doping Agency (USADA) drug testing. It was funny but I will spare you the details. Today's race was postponed because the high was -10 degrees. It warms up tomorrow so we will race Monday, Tuesday and Wednesday. No one likes drilling holes into brand new race skis. But, like waxing skis and gluing pole tips, mounting bindings is part of being a cross-country skier. The good news is, if you learn to do it yourself, you don't have to be at the mercy of your male teammates. The very wise Maria Stuber originally proved to me that women can do this, and then I got a refresher course from Lucas Schulz, whose sister Anna CAN CHANGE HER OWN BRAKE PADS. Here is a D.I.Y guide to mounting bindings. Plan A: Locate the nearest man and ask him politely to do it in exchange for baked goods. I see this as win-win, whereby you get your bindings mounted, plus you both get baked goods. If this fails, try Plan B.
a limited-depth drill bit that may actually be called a "binding drill bit." I suggest using the smallest one you can find. I used approximately a 3.6mm (diameter of hole) x 9mm (depth of hole) bit, which is the larger bit pictured below. The most important thing is the jig. You can find this online (to buy) or from your local ski shop or brand rep (to borrow). It makes the process relatively idiot-proof. You snap it onto your ski and then drill through the holes in the jig. The holes line up exactly where your binding screws go. And of course you'll need bindings! These are my new Salomon Pilot skate bindings. They come with three screws for the front, plus two along the foot plate. Nothing makes you feel like a bigger idiot than when you can't get the bit in or out of the drill, so I have explained that below. The round end of the bit goes into the drill. 1. Find the balance point (middle) of the ski by balancing it on something like a ski scraper, and mark it with a sharpie, as I have done here. 2. Clamp the jig onto the ski. The blue handles pivot to clamp or unclamp. You can do this on the floor (left), or if the bottom of the jig goes below the bottom of the ski, you may need to set it on a bench (right). 3. Find the line that marks the balance point on the jig, and line it up with the balance point of the ski (left). Push the jig all the way down until it touches the ski (right). The three triangle holes (below) should point towards the front of the ski. 4. Drilling time! The idea is just to get the holes started so you can put the screws in, so the holes don't have to be very big at all. If you hold the bit up next to the ski, you should see that it would only go a little ways into the ski. Hint: Some jigs have holes for multiple types of bindings, so make sure to drill only into the holes that are labeled with your specific binding type. P.S. It doesn't hurt to hold your binding up to the jig to make sure you've got the right jig. 5. Apply a drop of wood glue to each hole. 6. With the screws in the binding, line up the screws with the holes, and get the screws started with a screw driver. 7. You can actually screw them all the way in with a screwdriver if you prefer, but it is pretty hard work and takes a long time, so I recommend using a drill. So swap out your binding drill bit for the phillips-head bit. Pull the trigger slowly and push down hard on the screw with the drill, doing your best to keep the drill vertical. Try to stop the drill right before the screws are all the way in, and then finish them by hand with the screwdriver. This is mostly because the drill makes an awful noise when it gets the screw all the way in. Do the front three screws first, rotating between them so that they are all screwed in at about the same time, i.e. do not screw one screw in to completion before starting the next. Then do the foot plate screws afterwards. 8. You are almost there. Once the binding is secure, with all the screws finished by hand to ensure their tightness, you place this little screw cover over the rear-most screw. 9. Last step is to apply the decal to the front of the binding. And remember: just because you don't have to be at the mercy of your male teammates, doesn't mean you have to not be at the mercy of your male teammates. Modern feminism is all about being empowered to choose when you are ready to drill, and when you'd rather stick to the baked goods. The choice is now yours! Next lesson: gun cleaning! Here I am racing in the Craftsbury Opener last week. (Check out my blog post about the race.) Today we had our last shooting practice with Algis before we fly to Minnesota for IBU Cup trials. There is less than a week before our first race! We travel on the 11th and return on the 18th. Keep up on results on my Schedule & Results page. The top male and female from our IBU Cup trials races in Minnesota will likely be selected to race on the IBU Cup. Yesterday we did a time trial and I hit 75% of my targets, which is great for me. Biathlon results record the misses, so my results would read: 0p, 1p, 3s, 1s. I put the p's and s's in there so you would know prone versus standing. If I can shoot that well in MN and ski fast, I think I have a shot at making the IBU team! It was a gorgeous sunny Sunday in Vermont- perfect weather for Craftsbury's annual Demo Day. Caldwell Sport, one of the GRP's sponsors, came with an extensive fleet of skis and waxes for people to test trailside.